One of the fundamental tasks a letting agent or property manager will undertake when managing a rental portfolio is to effectively manage the rent collection. There is a whole ecosystem working here and if you have a good Rental Management Software system in place, it saves you a lot of time and effort. It also helps if you have managed to secure good quality referenced tenants for your properties, then you can reduce the possibility of the extra work load. The reality for some letting agencies is that managing the rental payments from tenants is quite a stressful (Full time) job. If all goes to plan and tenants pay on time via standing order or direct debit then the rent paying eco system flows perfectly. Tenant paying on time means the letting agency receives fees on time and the Landlord / Mortgage is paid on time. Usually what happens here is your landlord has a very good experience dealing with your letting agency and you retain the landlord as a customer. When managing rental properties it is important letting agents and property manager’s setup efficient ways to collect the monthly or weekly rent. 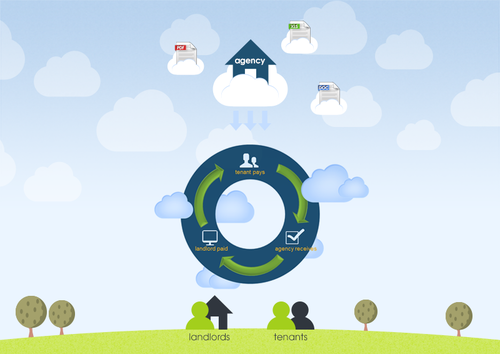 Agents who use Property Management Software can reduce admin time. Below I have listed some of the most popular methods. Standing order: The most cost effective way to manage rental payments is by setting up a standing order with your tenants for the rental payments. Make sure if you are managing multiple rental payments you include a reference code to identify the rent payment. Direct debit: This is a great way to collect rent payments and gives letting agencies great control when administrating rental payments. Similar to a standing order but with better controls, please beware of any cost implications for your letting agency if tenants funds bounce. I recently came across a company who facilitate the collection of funds via direct debit called www.gocardless.com who charge up to £2 per transaction. Losing or misplacing cash in office. Leaving your office open to robbery. Fraud issues with staff members administrating cash transactions. Cost of bank charges for cash lodgements can be expensive. Administration time managing cash lodgements. Bank lodgement: Allowing your tenants lodge funds directly to your bank is another method used by some property managers for their rent management. Agents need to be aware of the bank charges levied for allowing tenants to lodge to your bank account when using this method to collect rent. You will also need to be aware of lodged rental payments which are not referenced and from previous experience managing a rental portfolio, I can tell you that this can be an administration nightmare. Credit card: With increased access to debit and credit cards this could be a way to collect rent in the future but the costs are just too high at the moment and to get a merchant ID from a provider is sometimes difficult. Would you pay 2.9% or (£14.50) to collect rent of £500 from your tenants? You may also be interested in this infographic on The Costs of taking Monthly Rental Payments . Let us know what your experiences are in rent management, or if you have any questions, do get in touch!